For anyone interested in producing a musical, a recording can be an invaluable tool. It can serve as an introduction to an unfamiliar show, a reminder of a long-lost friend, or as a guide in the preparation of an old standard. For works new to our Library - and, presumably, new to most audiences - simply having the cast album can be essential. HEARTBEATS (Varse Sarabande), A GRAND NIGHT FOR SINGING (Varse Sarabande), WINGS (RCA Victor) and FLOYD COLLINS (Nonesuch) are a few examples. The newly-released DRG recording of the complete score for Irving Berlin's LOUISIANA PURCHASE is an ideal introduction to a surprising score which, although written in 1940, has rarely been heard until now. STATE FAIR falls somewhere between the "unfamiliar" and "long-lost friend" categories. On the one hand, it is a fondly-recollected Academy Award winner from 1945, and on the other hand it made its Broadway debut - and earned a Tony Award nomination for its score - only last year. The DRG cast album introduces never-before-recorded gems within a score already laden with hits. The album is not only a great listen, but a great resource, capturing nearly all of the extensive dance music and including the superb orchestrations and vocal arrangements that we will provide for performances. Irving Berlin's CALL ME MADAM certainly qualifies as a long-lost friend: for years synonymous with its original star, Ethel Merman, the musical emerged fresh as a daisy in a concert staging by New York City Center's Encores! series in 1995, and was subsequently recorded by DRG Records. Star Tyne Daly proved there was life after "the Merm," and as performed by Rob Fisher and the Coffee Club Orchestra, the score has proven irresistible to stock and amateur customers alike. The other great Berlin-Merman musical was never "long-lost," of course: ANNIE GET YOUR GUN celebrated a banner 50th Anniversary year in 1996, a milestone noted in JAY Records' new 2-CD recording starring Judy Kaye and Barry Bostwick and featuring all of the songs, reprises, incidental and dance music from the 1966 Lincoln Center revival which is the version we license. For a choreographer especially, it is vital to have a sense of the orchestrations - where the music crescendoes; when it's big and brassy, or light and ethereal; of the percussive accents in the music. This album provides that. The JAY recording also contains bonus tracks of two songs cut from the original Broadway production, and not available for performance, which brings up the delicate issue of when a recording is more tantalizing than tutorial. THE SOUND OF MUSIC, for instance, offers a sumptous movie soundtrack recording starring Julie Andrews that is one of the most cherished albums of all time; it is not, however, an appropriate guide for stage performances. Why? To begin with, the keys of Maria's songs were adjusted from the Broadway score; also, three songs from the musical were cut for the film soundtrack, two new songs were added, and other songs were re-assigned to different characters. The script we license, as performed on Broadway originally, does not therefore reflect the soundtrack. We consider the original Broadway cast album (Sony) starring Mary Martin to be the definitive aural guide to THE SOUND OF MUSIC. It is a vibrant recording in which the tempi and musical direction are impeccable and the orchestrations are exactly what we license. SHOW BOAT is an epic work that has never been "frozen." We license the highly popular 1946 Broadway version, which is produced several hundred times a year, and was sanctioned by its authors. The noteworthy 1988 EMI recording, however, contains an hour's worth of material cut from the original score that has us caught on the horns of a dilemma. As historians and buffs, we are grateful to maestro John McGlinn for preserving these fascinating out-takes by Messrs. Hammerstein and Kern, but as custodians of the licensed stage work we are not authorized to allow our customers to insert those numbers into their productions. As William Hammerstein stated in a New York Times interview: "When experienced, knowledgeable people cut material from a show, it's because it's not working, and they're usually right." Oklahoma! : the 1955 motion picture soundtrack (Angel) is flawless, and Robert Russell Bennett's orchestrations are so close to the originals (which we provide) that it's hard to tell the difference. Both the 1943 original cast album (MCA) and the 1979 Broadway revival (RCA) contain most of the score in the original orchestrations and are reliable sources. The only uncut rendition of the complete overture appears on Philips Classics' OPENING NIGHT: THE RODGERS & HAMMERSTEIN OVERTURES (see Concert Library story, p. 7). South Pacific: The 1949 original cast recording is still tops, and most valuable to those doing the show. The 1967 Music Theater of Lincoln Center production, starring Florence Henderson and Giorgio Tozzi, is, alas, out of print, but definitely worth a search in your local flea market bins. The 1986 CBS studio album includes several pieces rarely recorded but essential to any production: the Entr'acte and the military sequences' underscoring. Pal Joey: The 1951 studio recording produced by the master, Goddard Lieberson (available on Columbia), was so spectacular it sparked a Broadway revival. Listen to Vivienne Segal's dead-on delivery, and Harold Lang's insouciant bravado, then add on a few listens to the equally dazzling '95 recording of the Encores! cast, with Patti LuPone and Peter Gallagher. It is nearly complete, and features the licensed orchestrations of Hans Spialek. Carousel: The original cast album (MCA) has two noteworthy oddities: Alert listeners will note that ""The Carousel Waltz"" played there is not the version played ever since. It had been orchestrated by Robert Russell Bennett early in CAROUSEL's creation, but no longer exists on the printed page. Don Walker replaced Bennett as the CAROUSEL orchestrator, and it is his "Waltz" that has lived on. Also on the original cast album is a section of Billy Bigelow's "Soliloquy" cut during the original Broadway run. The 1965 Music Theater of Lincoln Center recording (RCA) is more complete and, since it contains Walker's version of "The Carousel Waltz," is truer to the materials we license for performance. 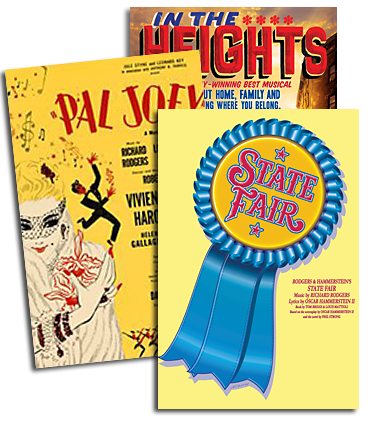 For our complete catalogue of musicals available for performance call The R&H Theatre Library at 212-564-4000 or fax 212-268-1245.